On this one hundredth anniversary of an event which transformed the world and Newfoundland along with it, it is important to keep in perspective the things we say and do. There is a tendency among some to define the Great War of 1914-18 exclusively through the lens of the Newfoundland Regiment, particularly the first five hundred men who volunteered and their blue puttees. On top of that there is also a tendency to reduce the total Great War effort of Newfoundland and Labradorians to a single day, a single battle on July 1st, 1916. Beaumont-Hamel, as part of the first day of the Somme Offensive, which lasted for almost five months, was a tragedy in every respect for British forces, of which the Newfoundland Regiment was a part. It was a tragedy of communications, leadership, vision, of misguided organization and a thorough lack of respect for human life by the upper military ranks. It was particularly tragic for the Newfoundland Regiment which was nearly wiped out; the single biggest loss of human life in one day in our history. This event was a defining moment in our history and we should remember those who bravely stepped into the line of fire and were slaughtered that day. Yet, there is more to the role of the Newfoundland Regiment in the Great War which we must also never forget. In many books there is a glorification of those who died; but what of those who didn’t die? What of those Regiment members who weren’t on that battlefield that day? What of the survivors of that battle? Was their effort any less on that day? Was their heroism somewhat reduced because they survived the massacre? We must be cautious that we don’t allow our greatest loss on the battlefield to define our collective war effort and our collective memory. There were many more battles, many where the Newfoundland Regiment led or contributed greatly to victory. Battles like Monchy-le-Proux, Cambrai, Gueudecourt, etc. ; battles where soldiers from our many Newfoundland and Labrador outports gave their lives, earned medals and commendations for their bravery. And, there was more to the war effort than the Regiment. There were the Royal Naval Reserves and the Forestry Corp; there were those who served with the Voluntary Aid Detachment, the Canadian Expeditionary Forces, and those who served with United States Forces and those of other countries. All of these men and women served Newfoundland and the “Mother Country”. Many of them died in far-off places like Egypt and Gallipoli; torpedoed on the ocean, lying in hospitals, during training and elsewhere. Their sacrifices were no less. Those who survived the Great War, however and wherever they served, suffered injuries physical and mental, grieved for fallen comrades, lost limbs, memories and some even lost their minds. They too must be remembered; they who came home, the ‘lucky ones’ who were condemned to recall and remember the horrors of what they’d seen and experienced until death gave them reprieve. Many of them suffered in silence without help, without support. Many were forced to fight again for assistance from a government which had begged, cajoled and shamed them into volunteering in the first place. We must remember them as well. In our haste to remember, to commemorate, we must also not forget that soldiers came from all over the Dominion of Newfoundland. Much is spoken and written of the men and women who enlisted from the families of politicians, merchants and fraternities or well-known city schools in the capital city. Yes, their efforts were important and should be held up to our eyes today. But in doing so let’s remember that their service was no greater than those who came from communities all around our fair Dominion. There is a tendency to glorify family names as though the young men and women born into those names held more value than others of other parentage. In the end, on the battlefield, in the forests, the hospitals, they are all soldiers with one life to live, one life to give; all with families, lovers, friends at home. Let’s not forget the impact of losing a half dozen young men from a small community had on the future of that community. As we embark on the 100th commemoration let’s remember all who came forth and laid their lives on the line; let’s remember the fallen; let’s remember the survivors; let’s remember the injured; let’s remember the families whose children were taken away from home, and let’s remember those parents who died while their children were away fighting in a foreign land. Let’s remember that for Newfoundland this war was bigger than one place, bigger than those who died or served; bigger than any single day or any single battle. For if we don’t, we perpetuate the myths and misinformation to another generation thereby making the whole story of Newfoundland’s role in the Great War even more challenging to tell. These are but the people I have been able to identify who served from St. Jacques. It is highly likely there were others. Let’s remember their families and the sacrifices they made during the war; the women who knitted socks, hats and mittens; raised funds to purchase equipment and who wrote letters to soldiers. Let’s remember the mothers and fathers who waited weeks and months for news from the war, who spent endless nights not knowing. The twelve men I have been able to identify from St. Jacques all returned. Some, like Leonard Burke came home injured. How many of them suffered from Post-Traumatic Stress Syndrome (PTSD) we will never know. Most would not talk of their experiences in their lifetime. For some the war didn’t end when they returned home; they re-lived it every night in their dreams for the rest of their lives. Others like Edgar Skinner, Anthony Burke and Sam Farrell volunteered for service again at the outbreak of WW 2. Finally let us never forget those people who tried their best to comfort the troubled minds of soldiers who so willingly or reluctantly left the warmth and security of their homes to travel around the world to fight in places many of them had never heard of before, and would never forget. It is quite appropriate to have the ‘forget-me-not’ as the official flower of remembrance of those who served in the Great War. Some suggest the common field flower which so delicately presents itself throughout the island of Newfoundland came here from Europe following the war, perhaps in the garments of returning soldiers. That may have happened, yet it is likely the flower bloomed in the backyards of families long before the Great War arrived and the phrase ‘forget-me-not’ fell from the lips of teenage lovers and wives throughout the coves and crannies of Newfoundland and Labrador as their loved ones set off to fight for ‘king and country. Today, as we contemplate the sacrifices made by all Newfoundlanders and Labradorians in the Great War, let’s not only remember those who died but all of those who survived to help build this great place of ours and as many poets have lamented let’s also remember those who were never born. Let us not forget all of the human sacrifices that occurred during those four years between 1914 and 1918, a war that was not expected to last beyond Christmas in the year it broke out. 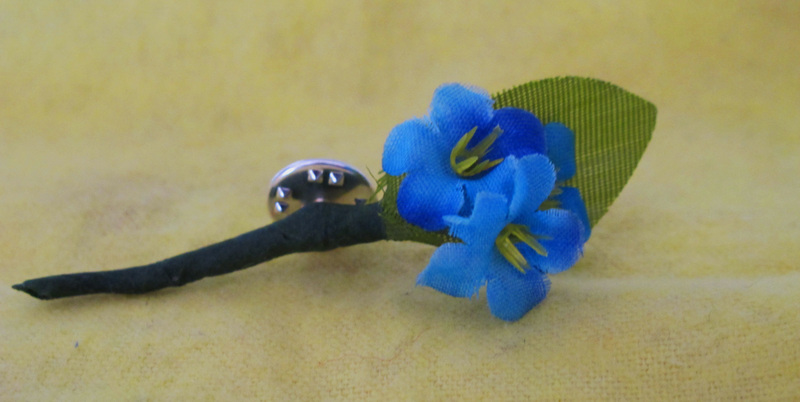 Wear a ‘Forget- me-Not’ proudly and during all of the events and discussion around this 100th commemoration. Remember ALL who sacrificed between 1914 and 1918 and the years which followed all the way down through time to today. 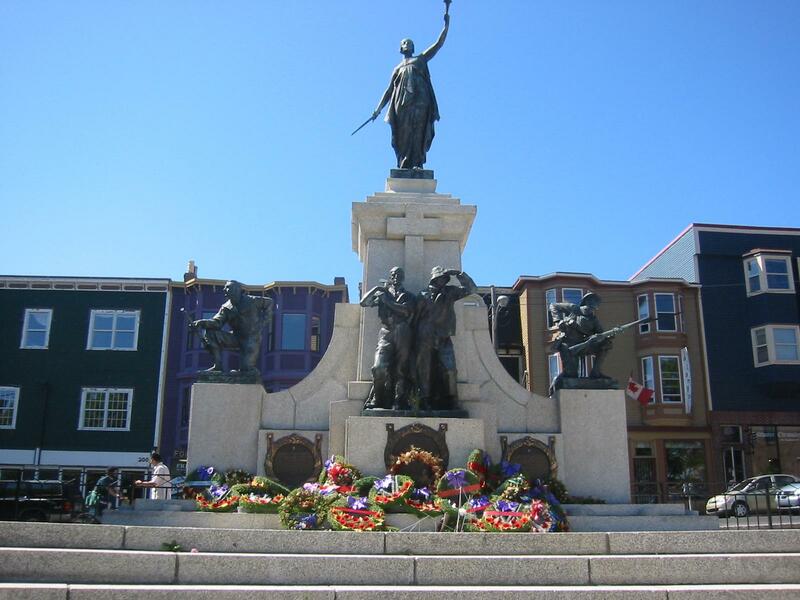 The links below provide more information about Newfoundland and Labrador’s contribution to the Great War. Take time to explore this momentous event in the cultural, emotional, social and spiritual heritage of Newfoundland and Labrador. Royal Newfoundland Regiment War Diary – a document which recorded the day-to-day activities of the Regiment from the first to the last day of the war. This isn’t a story about the war but a document that tells quite a story. Newfoundland in the First World War – a thorough and detailed site which provided information and documentation of the Voluntary Aid Detachment, the Forestry Corp, the Naval Reserves and the Regiment. O’Brien, Patricia Ruth (1981) The Newfoundland Patriotic Association: the administration of the war effort, 1914-1918. 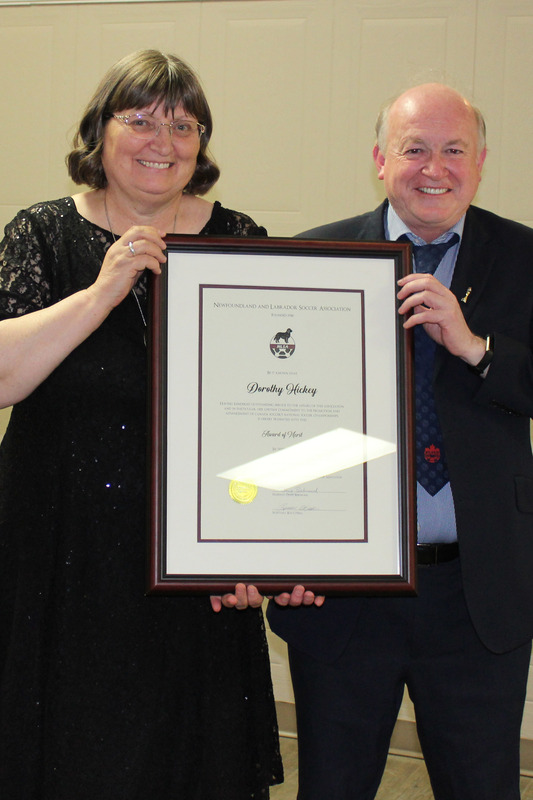 Masters thesis, Memorial University of Newfoundland. This thesis research provides a look at the role of the Newfoundland Patriotic Association in recruitment during the war. I enjoyed reading this article !